This book offers the beginning undergraduate student some of the vista of modern mathematics by developing and presenting the tools needed to gain an understanding of the arithmetic of elliptic curves over finite fields and their applications to modern cryptography. 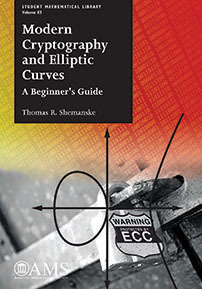 This gradual introduction also makes a significant effort to teach students how to produce or discover a proof by presenting mathematics as an exploration, and at the same time, it provides the necessary mathematical underpinnings to investigate the practical and implementation side of elliptic curve cryptography (ECC). Elements of abstract algebra, number theory, and affine and projective geometry are introduced and developed, and their interplay is exploited. Algebra and geometry combine to characterize congruent numbers via rational points on the unit circle, and group law for the set of points on an elliptic curve arises from geometric intuition provided by Bézout's theorem as well as the construction of projective space. The structure of the unit group of the integers modulo a prime explains RSA encryption, Pollard's method of factorization, Diffie–Hellman key exchange, and ElGamal encryption, while the group of points of an elliptic curve over a finite field motivates Lenstra's elliptic curve factorization method and ECC. The only real prerequisite for this book is a course on one-variable calculus; other necessary mathematical topics are introduced on-the-fly. Numerous exercises further guide the exploration. Undergraduate and graduate students interested in elliptic curves with applications to cryptography. The main objective of this book, which is mainly aimed at undergraduate students, is to explain the arithmetic of elliptic curves defined over finite fields and to show how those curves can be used in cryptography. In order to do that, the author purposely avoids complex mathematical demonstrations and, instead, presents the concepts in a more descriptive way, suggesting some topics for further exploration by the reader.